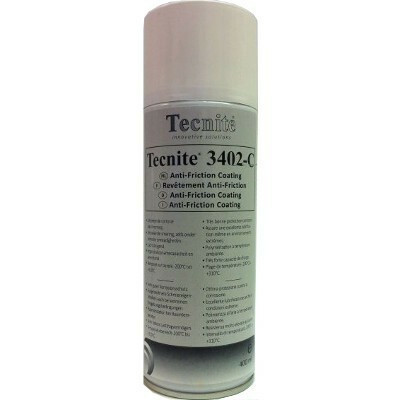 TECNITE 3402-C (400 ML SPRAY) – AN EXCELLENT COMBINATION OF CORROSION PROTECTION AND LUBRICATION! Zde se nacházíte: Zprávy / novinky> Nové produkty> TECNITE 3402-C (400 mL Spray) – an excellent combination of corrosion protection and lubrication! TECNITE 3402-C is an air-curing dry film lubricant coating that combines the advantages of corrosion protection and lubrication. This product is based on an Anti-Friction-Coating® from Molykote® 3402 C - available in an 400mL aerosol can - for better handling. Applications: Long-term lubrication under heavy loads, at low speeds and harsh environments. Excellent performance if used for the running-in of aluminium/steel contacts as well as for protection of stored material from corrosion.